Samsung's Galaxy A series could be described as a mid-to-upper-mid range of handsets, including the likes of the Galaxy A3 (2016), Galaxy A5 (2016), Galaxy A7 (2016) and Galaxy A9 (2016). Recently, benchmarks revealed the existence of a new Galaxy A5 (2017) (SM-A520F), with further reports suggesting that the upcoming device would be joined by some of its usual friends. 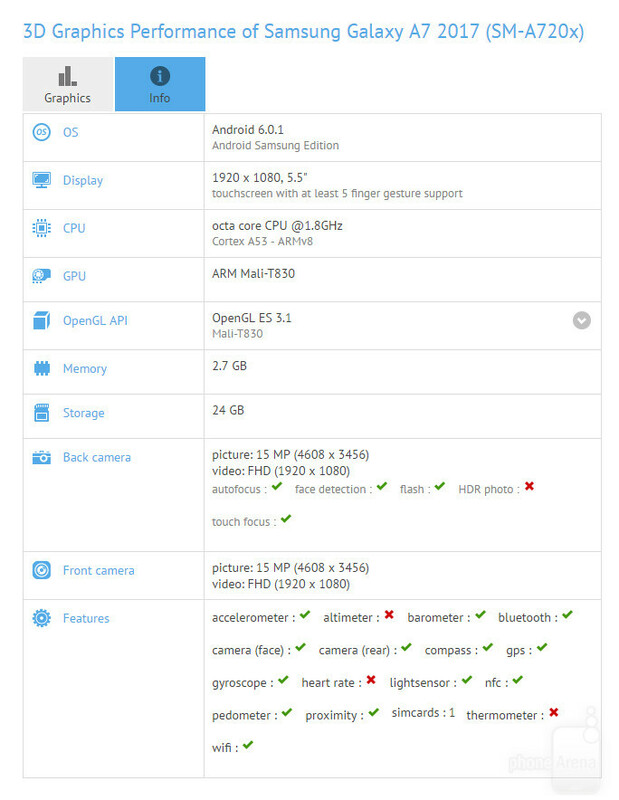 Now, GFXBench has spotted a Samsung Galaxy A7 (2017) (SM-A720x) in the wild. For a little background, the current version of the Galaxy A7 includes Qualcomm's Snapdragon 615, 3 gigs of RAM, a 5.5-inch FHD display, 16 GB of expandable storage, a 3300 mAh battery and 5 / 13-megapixel cameras on the front and back respectively. According to GFXBench, the new model will be furnished with the same 1080 x 1920 display, but will be powered by Samsung's own Exynos 7870 chipset with Mali T830 graphics this time. There's set to be 3 GB RAM once more, while the likely expandable storage could also double up to 32 GB. Elsewhere, Samsung has decided to change both of the cameras. The front and back shooters of the Galaxy A7 check in at 16 megapixels apiece, which is in line with what we're expecting of the Galaxy A5 (2017). Software-wise, the version that has checked through GFXBench includes Android 6.0.1 Marshmallow. Given that Samsung will probably launch the refreshed A series models very late this year to early next, it's reasonable to hope that Android 7.0 Nougat could be on board. However, we should hasten to add that the current A7 (2016) shipped with the older Android 5.1 Lollipop, despite the fact that Marshmallow had been around for a good few months. Either way, we expect Samsung's TouchWiz overlay to feature once more. We'll have more info as it arrives, so stay tuned. You guys need to add an extra section in the specs for Samsung phones. "Probability of Exploding". Hmm, they should have gone with the SD 625 as it woild allow for better performance making it a proper mid range to upper midrange phone as seen on the Moto Z Play reviews. It's going to have Exynos 7870, not 7880. The question is will it explode ?